Flo is a cow who lives on a beautiful farm near Millbrook, Ontario. She spends her days in a lush, green pasture that borders on a country road. The cows have access to a nice pond for drinking and for cooling off in. 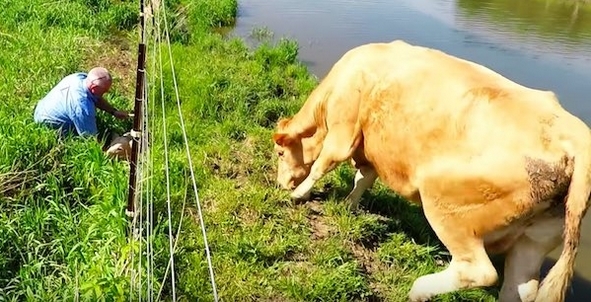 But Flo was anything but happy when she delivered a calf only to have it slide down and under the electrical fence and become trapped outside the field and away from her. That’s when Dave was passing by on the road and saw the cows enjoying a dip in the pond to get out of the heat. 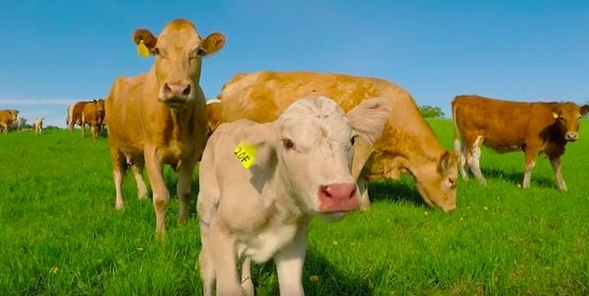 He stopped to film them, and noticed one cow was very upset. Flo kept scraping the ground by the fence and mooing. He slowly realized she needed help. 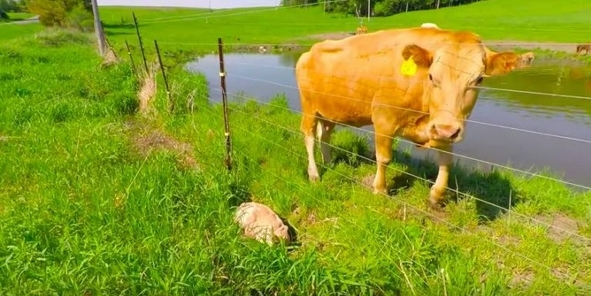 He noticed her calf lying in the hot sun, stuck on the other side of the fence. He saw the umbilical cord and realized the calf had been born that day. How long it had been trapped he didn’t know, but it was dry and needed milk. Dave was worried that going near the calf would upset the cow but he decided to try and help. 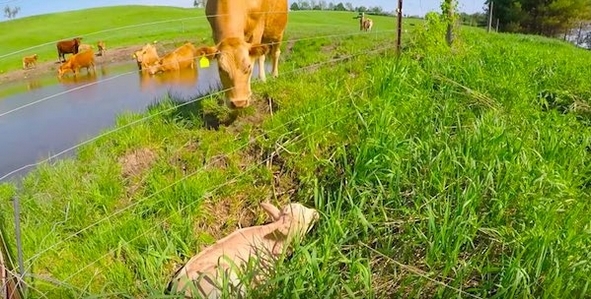 He used a stick to lift the electric fence but it was still concerning when the cow began to kick dirt up with her front hoof as she watched him handle her baby. “He is no brave farmer and wires won’t stop an angry momma,” said a video caption. Dave and the calf were both getting shocks, but Dave finally managed to get the calf through the fence. Mama and baby immediately sniffed each other and began walking out into the pasture together. Dave went to tell the farmer, who came and checked on the calf and tagged its ear. It was in good health. Later on, the two cows seemed to recognize Dave and the calf wandered up to Dave for a curious sniff, as did Flo. 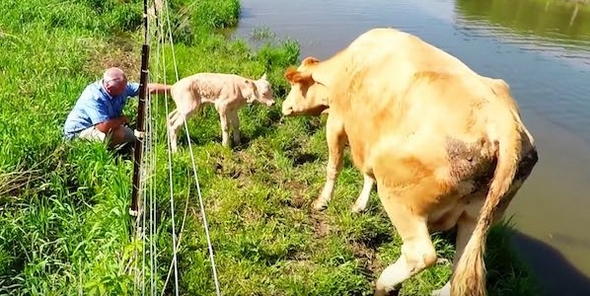 Responses to "Worried Cow Asks Man To Rescue Her Newborn Calf"